The Car: 1956 356A Porsche — Car 58: Where are you? 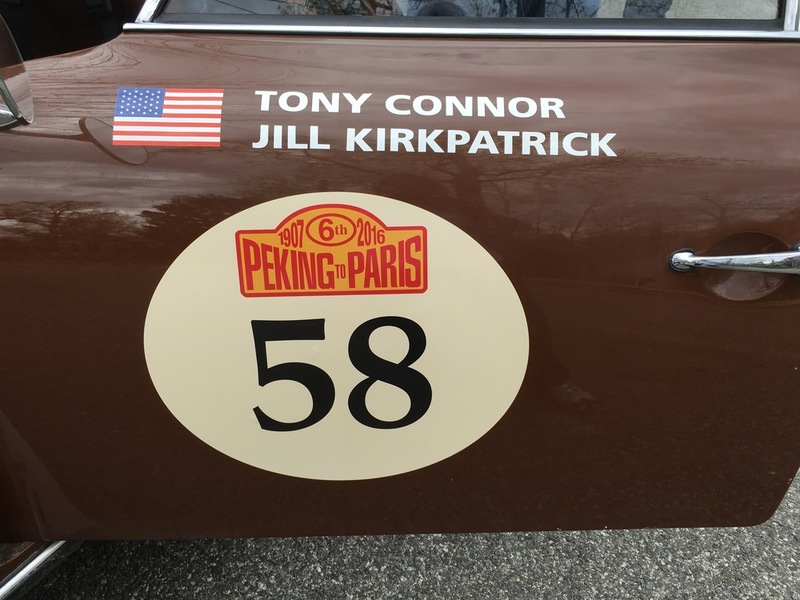 Once I picked my heart up off the floor after hearing that Jill had signed us up for Peking to Paris 2016, I started looking for a car. Literally, that minute! My first thought was to get an early Bentley from the 1920's. I had romantic notions of speeding along in an open top car, wind in my face and dust in my eyes (ears, hair and everything else). Jill suggested that was a bad idea, but I ignored that advice… until I saw the price tag. I then saw how wise my wife really is. As I have heard several times, never argue with your navigator; they know the way! I have a passion for Porsche, and always have. The problem is, I have a Kia budget! A great friend of ours, Stephen Serio, the main car guy of the Bond Group and Aston Martin New England, worked with me for months trying to figure out what car we should use for the event. He first suggested starting with a smaller event, like Copper State 1000 or the Great Race. When that failed, he suggested therapy. When that failed, he suggested the second love of my life, a 1956 356A. It was in my budget, and it was a perfect shade of dark, dark, dark brown. The car was an outlaw already, highly modified in the 1990s by a very reputable builder with a 912 Porsche engine and suspension, rally seats, disc brakes and a 12-volt electric system. Many of the tasks we would need to do were already completed, which was important to me; I did not want to destroy an original car. The car had covered 5,000 miles since it was built in the 1990’s. I spent the next year using the car as much as possible, getting to know its positive and negative features. In April of 2015, Blue Ridge Motorwerks began the build. I also contacted Simon Ayris of Rally Prep Services. Simon's firm is based in the U.K., and he and his firm have built many cars for this rally and many other rallies over the years! In fact, RPS built the winning car in the 2013 Peking to Paris! Simon asked for pictures of Java so he could start advising us how to prep the car. His first statement was a little daunting, "That’s a nice street car; you have a lot of work ahead!" Looking back at that moment, I now understand what Simon meant. Without Simon advising us by picture and phone, I am not sure Java would have turned out as well as I HOPE he has. 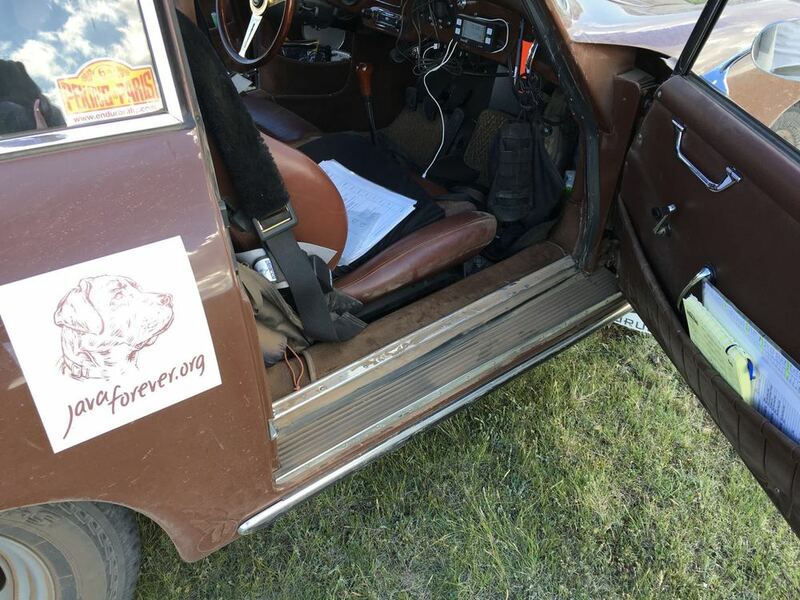 All that remains of the original outlaw is the headliner and sun visors (original to the car), the rally seats, and, of course, the brown paint. A new engine was built up and the compression lowered to 7.5 to 1 to accommodate the low octane fuel we will be getting in Mongolia. We also installed a fuel dump system, should we get mostly water in our fuel, and had a 19 gallon gas tank made. We installed and reinforced our suspension system, two fuel systems, and two ignition systems, all of which run through the master panel in the cockpit. The steering linkage system was reinforced and protected, the car rewired (nearly all of it) and, finally, two large skid plates protect the bottom the car and the engine. A million other items were done to hopefully keep us safe and moving forward! I am proud to say that Jill and I covered an additional 10,000 miles in the car before it was shipped to China. We've tested our Porsche, called Java, on trips from Washington, DC to Bozeman, MT and on every dirt road we could find in the DC area (yes, there is an app to find them!) and he has, mostly, passed with flying colors. I am always asked why I am doing this rally with my wife; actually, I most often hear, “You’re crazy to do this with your wife!” I can't think of another person I would rather do this with. How often do you get to spend this much time with one special person? Not often. So to me, I am already the winner of the rally. I have spent countless hours going over the event, the car, and the build of the car, all with a very special person. Three years, endless advice and encouragement from friends and family, three engines, one navigation course in London (during which we may or may not have driven our loaner Jag into more than one English countryside hedge), and a pretty penny later, Java was ready to race! Thanks go to Tim Berardelli for building and obtaining a great engine for us, and to the Schebish Brothers for all the custom fabrication and additional design, and installation work.